A few weeks ago I was contacted by the absolute doll that is Jessica from PinUpPersuasion saying she'd been in touch with Orchard Corset and asked if they could send me a corset to review as a thank you for being her favourite lingerie blogger! After some time of wallowing in utter flattery, I headed over to Orchard Corset's website to browse their selection. Since I'd already purchased the ever popular CS-426 underbust a few months back (which I'm yet to review) and own a number of overbusts, I opted for the mini underbust, the relatively new CS-301 in black cotton. I went for a 20", a size smaller than the recommended 22" for my 26" waist. Currently at $65 (£38) I consider the CS-301 a cheaper alternative to the What Katie Did Baby Corset at £129.50. Since I've not tried the WKD Baby, I can't do a comparison of the two, but I will say the only differences I can see are that the Baby is 7" long and curved at the bottom and the CS-301 is 8" long and is straight at the bottom. The CS-301 is much easier to wear than longer corsets since it has a very short rise so you don't feel quite as restricted. It only has 3 fasteners too, meaning you can do a quick release should you feel uncomfortable or claustrophobic, which I sometimes feel a slight hint of when corseted. Yes, I know you're meant to unlace the corset first, but with the CS-301 I don't feel this is necessary. I've owned a LOT of steel boned corsets over the years but never actually wear them so I'd consider myself a corset newbie. I wore my CS-301 on a hot summer's day with my navy polka dot dress from Pepperberry (no longer available) to a local vintage fair. Aside from some itching in the back panel, it was relatively comfortable and I managed to clock up a few hours wear including a large slice of lemon drizzle cake before I decided it had to go as I was too hot and itchy! A few weeks later I decided to wear the corset to bed and for the following day, only this time with a cami underneath. It was remarkably comfortable and I only took it off to eat lunch. I'm far too lazy to get up early enough in the morning to lace a corset so wearing one in bed and for the following day would be the only way for me to waist train. My only complaint about the CS-301 is because it's a short corset, when I sit down I have a 'muffin bottom' effect in my lower belly region. This wasn't such as issue since I was wearing a swing dress at the time, but it would mean I couldn't wear the corset with a fitted dress. Not unless I wasn't needing to sit down at least. 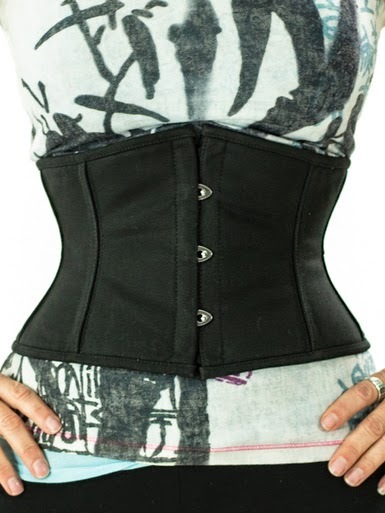 I'd recommend this corset to anyone, old or new to the world of corsetry as it is an easy starter corset, or for those waist training and wanting a break from a longer corset, this would be ideal. I'd love to waist train and may start wearing my CS-301 to start with, then move on to my CS-426 eventually. You look fabulous showcasing the Orchard Corset CS-301 corset. I've always liked waist-cinchers but not surprisingly don't have a lovely figure like yours. You achieved a tight-laced wasp-waist look. It's amazing that you can manage a quick-release with it. I'm sure the Orchard Corset CS-426 Steel Boned Satin Longline Underbust Corset would look fabulous on you as well. You look great in the CS-301. I was actually using these reviews but seeing you try on the corset and sharing your first hand experience has made me opt for the CS-301.